Easy to throw and easy to control, the Impact will help you to stay in the fairway and lower your scores. 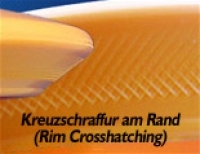 The engineered rim crosshatching projects a faint wave around the Impact as it flies, displacing air to enhance glide while keeping the disc flat and straight. The 150g Class* is most suitable for beginners, youth player, women and for everybody who wants to achieve more distance with less power and more control. 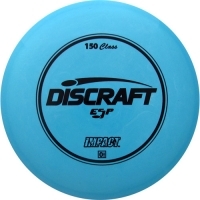 * "150g Class" means, the disc has a weight around 150g, whereas most Disc Golf discs weigh about 165g to 175g. Notable: Controllable for virtually all players. Easy to throw and stays in the fairway. Read more about Stability-Ratings here. Please note: Disc colours may vary and can't be chosen. This Product was added to our catalogue on Monday, 14. November 2011.